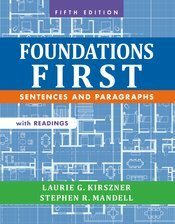 Foundations First combines engaging readings, concise yet thorough instruction, student-friendly examples, and practical exercises to get your students writing sentences and paragraphs immediately. While recognizing and respecting students’ abilities, best-selling authors and veteran college writing instructors Laurie Kirszner and Stephen Mandell break down the steps necessary to excel in college writing, tackling ESL concerns, vocabulary development, critical thinking and reading skills, and the essentials of grammar. The authors believe that students learn to write best when they use their own writing as a starting point. Each chapter starts with a visual writing prompt that students respond to right away. As students move through the book, their skills are reinforced by samples of exemplary writing, recursive writing process instruction, and practice exercises. Students are also encouraged to return to their own writing throughout the process as they learn the value of editing and revising. This new edition incorporates user feedback with the inclusion of TEST, the Kirszner-Mandell model emphasizing the significance of the topic sentence, evidence, summary statement, and transitions in student writing. Foundations First has been redesigned with a clean, bright, and clear layout. This edition can be packaged with LaunchPad Solo for Foundations First, which includes LearningCurve, the adaptive online quizzing program with immediate feedback that 95% of students surveyed recommended to their peers. Additional online multiple-choice grammar exercises offer even more practice on the grammar concepts students find most challenging.